“Advaïta” means “Not 2” in sanskrit, or “non duality”. Advaïta vedanta is the understanding that reality is truly non dual, separation does not exist. What does it mean in more daily terms? It is our habit/conditioning to see that we, the others and the world are separate entities, with limited contours and shapes. From this dualistic view of life, one’s individual consciousness would then be separate and different from that of another individual. One’s consciousness would also be confined within one’s brain and would know all the changes and the destiny of the body and the mind. In other words, “I” was born at the date of birth of the body, “I” is transformed as the body and the ming changes, and finally “I” will disappear at the death of this same body. This dualistic view of life is the source of all the psychological sufferings of human beings and of most of today’s ecological and societal issues (fierce competition and pursuit of profits, exploitation and abuse, drugs and alcohol, inequality between races or gender, etc.). Indeed, we can imagine this scenario: being born with the physical body, one feels very small, different and separate from the others and the world. one can well see one’s own limits: the body being a vulnerable entity which can fall sick and dysfunction, it can also disappear at any moment. One must then do all to protect it and to accumulate as many pleasurable experiences as possible during one’s life time. Believing to be separate, one mostly feels very incomplete. Life becomes a quest for acquiring or to reach fulfilment in order to cover up the emptiness experienced within. Very often, the ego-mind tries to make one believe that happiness will come with the perfect partner, the perfect job or situation, etc…But whether the object of our quest is attained or not, the happiness thus experienced if very short lived. Life with its perpetual changes puts an end to our fragile happiness. And the quest for something else is resumed once more! Even in human relationships, the belief of separation makes one pursue only relationships that agrandize oneself and reject any situation where there is a risk to be diminished. When one’s self image is in jeopardy, conflict arises. This is being played out at the individual scale, but it is the same process at any other larger scale, groups, organizations, nations. When one is tired of looking outward in the realm of external experiences one’s happiness, this is when life gives one the opportunity to look inward, to face and explore the fundamental question: who am I? The non dual teachings is all about exploring our actual experience and learn to see what is, without any pre-conception or beliefs. We just see and recognize the essential nature of experience, which is made of only our Self as pure consciousness. By the observation and the exploration of our sensorial experience (given through the 5 senses), one recognises that perceptions and sensations come and go within the space of consciousness, which does not change or move at all. Sensations have not always been the same before, and are ever changing from one moment to the next. Sounds, visions, smells are never exactly the same at each instant. Every sensorial phenomena is in constant movement. Similarly, our thoughts come and go. Even our ideas and beliefs change over time. Change is what is being observed all the time. But that within oneself that never changes and that perceives all the changes is consciousness. Our consciousness is the stable element of our experience, whatever the content of our experience may be. When a thought appears, our consciousness can notice it. When this same thought evaporates, our consciousness can also notice it but consciousness itself remains the same. This is the same for sensations, sounds, visions, etc. The recognition of our true nature/identity as consciousness the becomes our incorruptible foundation for peace and freedom. We realise that the content of our experience changes, but the essence of our identity remains and is not subject to time and space, it is eternal. With the path of wisdom, we have been only half way. The main risk is to remain stuck there and to remain as the inner witness, far and aloof from the others and the world. The 2nd part, the path of beauty and love, is about recognizing the simple fact that all we know of a world is only our perceptions. We do not know a world, we know only the experience of sensing, hearing, seeing, perceiving. In which space takes place perceiving? If we observe our real experience, all the perceiving appears always in our consciousness, and never any where else. Is there any other experience that has ever appeared outside of consciousness? NO! There comes the realisation that it was never consciousness that was born out of the body, but the other way around: it is the body and the mind that appear in consciousness. Our life paradigm has changed radically. From that understanding, which is not a belief but a fact, the path is about applying this wisdom to all the aspects of our life. It is a moment-to-moment endeavour, as subtle as may be. Progressively, the way we perceive reality and the way we feel translates this new understanding of the nature of experience. 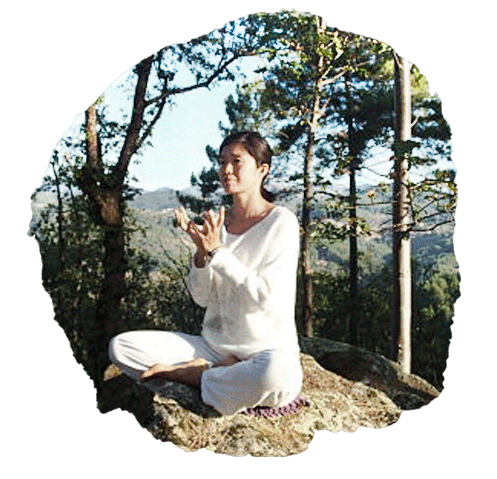 If you are motivated to learn more about non duality, please join Kamala’s workshops organized in Paris Opéra and in Chatou (78). To understand merely by the intellect will not do. The teachings have to sink into your heart and become alive in your every day seeing and perceiving. Only then the nectar of your own Self will pour into your life as perduring peace, freedom, beauty and happiness.